Norwegian parody-pop duo Ylvis is topping the Youtube popularity charts this month with “The Fox”, a music video promoting the third series of their Norwegian talk show I kveld med YLVIS (Tonight with YLVIS) on TVNorge. 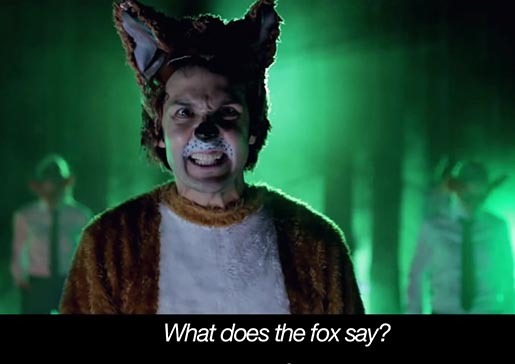 Brothers Bård and Vegard Ylvisåker and fellow actors appear in furry costumes in their satirical take on popular music videos, asking the question, “What does the Fox say?”, complete with subtitles. American television channel Fox gained permission to use the song in their promo ad, “WTFox Say?!? !”, syncing the music to the lips and moves of characters of Dance to the Top, Family Guy, Bones, Enlisted, The Simpsons, American Dad, Glee, Almost Human, Masterchef Junior, New Girl, Dads, The Mindy Project, Sleepy Hollow, The X Factor and Raising Hope. Music was by Ylvis members Bård and Vegard Ylvisåker, with Tor Erik Hermansen and Mikkel S. Eriksen at Stargate, New York. Lyrics are by Bård and Vegard Ylvisåker and Christian Løchstøer, managing editor at I kveld med YLVIS. Filming was shot by director Ole Martin Hafsmo via Concorde TV, Oslo, with director of photography Magnus Flåto, choreographer Thea Bay and colourist Camilla Holst Vea at Storyline Studios. Four earlier music videos from 2011 and 2012, “Stonehenge”, “Pressure”, “Jan Egeland” and “Someone like me”, show Ylvis has a long term commitment to music comedy.